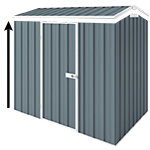 This 0.78m x 1.52m x 1.8m single door colorbond shed is made from superior quality steel and manufactured in Australia. I bought this shed online and collected it from the Sydney Depot at Prestons. Service at the depot was swift and friendly and the packaging for the shed was great - minimal with all hardware included. Assembly was straight forward with easy to use instructions and the size of this shed was fine to build by yourself if you don't mind DIY. All four sides, roof and door connected in less than 3 hours (could do this quicker if you had an extra hand of course)! The build material and quality is very high and built to last. This size shed is perfect for a small area either next to a garage or wall. Perfect to store away the lawnmower and garden tools. I put in a metal shelf system at the back which allows extra utilisation as well. The front door on the shed runs smoothly and I highly recommend this and other sheds from this supplier. As long as you have a couple of screwdrivers, pop rivet gun and a drill, it will go up in no time.